Officer Brian Kerr speaks with Johnathon Lowry and Tyrone Marsaw following complaints of marijuana odors on State Street. In Santa Barbara’s ongoing cat-and-mouse campaign targeting homeless people, the City Council voted to remove two waterless fountains now adorning the 500 block of State Street because they constitute an “unattractive nuisance” by giving homeless people a place to perch. The council’s 6-0 vote came despite strong opposition from the Historic Landmarks Commission (HLC), which had voted 6-1 in support of the fountains, which commissioners deemed to be in keeping with the city’s historic character. 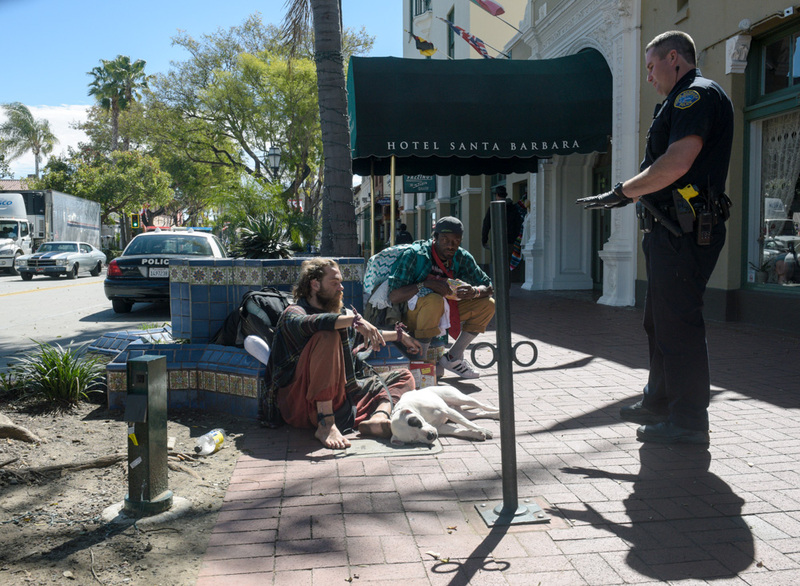 The sole dissenting vote among the HLC ​— ​Commissioner Bill Mahan ​— ​opined that the homeless people who congregate by the fountains distract from the character of the Hotel Santa Barbara, which Mahan maintained was also historic. The move to remove the fountains originated with Santa Barbara’s Downtown Parking Department, which also runs several of the programs designed to discourage loiterers. Those efforts were stymied by the fountains by Hotel Santa Barbara, filled with dirt since the drought. A hotel security guard told councilmembers that homeless people smoke marijuana, curse, and congregate by the fountain, annoying hotel guests. Independent photographer Paul Wellman encountered two congenial fountain folk, one of whom offered him some pot while the other lounged on the sidewalk. Two police officers approached, asked questions, and took names. No citations were issued. In response to escalating complaints about homeless people, City Hall has been quietly rearranging the street furniture ​— ​bus-stop benches, downtown benches ​— ​to either remove resting spaces altogether or to reorient the benches to face the street as opposed to passersby on the sidewalk.